HAMPTONBURGH—At $736.4 million, Orange County Executive Steven Neuhaus’s proposed 2017 budget is almost 2 percent higher than 2016’s, but he predicts taxes for most residents and businesses will go down and the county will stay below the tax cap. In his state of the county address Sept. 30, Neuhaus said the tax base—the value of taxable property—is growing in most parts of the county, so while the budget is bigger this year, the added cost in most places is offset. Of Orange County’s 23 towns and cities, only the towns of Mount Hope, Deerpark, Highlands, Tuxedo, and the City of Newburgh did not see an increase in their tax base this year, the county executive showed with a map. And the increase has been getting bigger for the last three years. In 2014, it was less than 1 percent, in 2015 it was over 1 percent, and so far this year, the tax base has grown over 3 percent, Neuhaus said. Of the $736.4 million budget, $437 million would go toward contractual expenses, $156.4 million would go to employees, and another $101.9 would go toward their benefits. Another $32.8 million would be for debt and debt interest, and just $1 million would be left for equipment and capital expenses. Sales tax for the county will stay the same at 3.75 percent and is estimated to generate at $265.4 million for the county and municipalities. Neuhaus said they are using a more realistic formula this year to calculate sales tax because they learned the hard way from previous years when the county overestimated sales tax revenue, and both the county and the municipalities that followed their formula fell short. The county finally wrote off $29 million it had set aside in the 1980s for the Orange County Water Authority. The other big change this year is that the county finally wrote off $29 million it had set aside in the 1980s for the Orange County Water Authority that, until this year, was on the county’s books as an asset that would eventually be paid back. Most of that money was not spent by the Water Authority, but on paper it looked like a big IOU from it, and the chance of the Water Authority, or the county, paying it back was slim, Neuhaus said. “Because I’m one of the youngest elected officials … I’m probably the only guy who would maybe see in my lifetime that $29 million ever paid back,” he said. Writing it off turned out to be a good decision, both for the Water Authority and for the county’s credit rating, which Moody’s Investors Service upgraded from a negative to a stable outlook this year. “The stable outlook reflects the stabilization of finances by new management and the expected return to surplus operations in 2016,” Moody’s said in its report. That $29 million was also one of the reasons the state comptroller listed the county as “susceptible” to fiscal stress, Neuhaus said. Some other positive trends, according to Neuhaus, are that towns and cities will not pay up to $1 million in election costs in 2017, seven labor contracts were renegotiated this year, the hotel and motel occupancy tax increased 23 percent over last year, and over 98 percent of property owners were able to pay their property taxes this year, which means less delinquent properties. 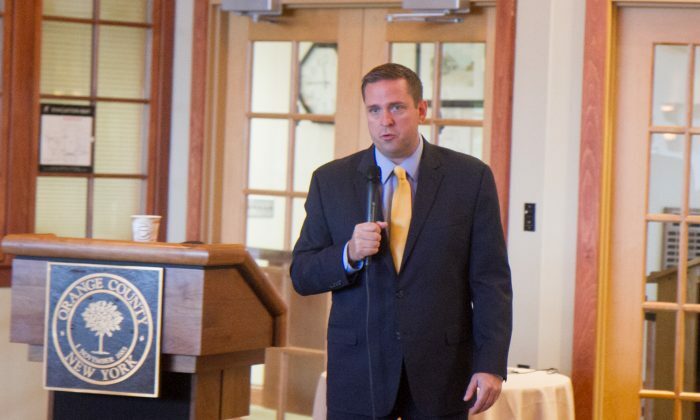 Some concerns he noted during his presentation, held at Graham Skea Lodge in Thomas Bull Memorial Park, were a projected 15-cent fuel increase for next year, increasing bomb threats in the county and active shooter situations around the nation, and how the presidential election will affect the economy. The Legislature is set to vote at its Oct. 6 meeting on the date of a public hearing for the county’s 2017 budget.